Every person upon the Earth has the ability to receive and accept healing vibrations whether it is from another human being, from an inner plane being or the universe of the Creator. To receive healing is a divine right for all souls on the Earth or the inner planes. It is also important to realise it is every person’s divine right and natural ability to express healing energies from their beings to themselves or others. This means that every person can be healed and can be the healer. When you realise your divine right and natural ability, you empower yourself. The universe of the Creator is always delivering healing frequencies to you and through you it is simply your choice as to whether you wish to receive it solely to support yourself or to share it with others in need. Many people also believe that in order to be a healer there is a need to be guided or instructed in how to express healing energies. There are many organisations which will support you in this matter upon the Earth and the inner planes; they offer an in-depth understanding while encouraging you to take responsibility for your healing ability. They may focus your awareness to certain healing energies within the universe of the Creator you can call upon to work with you. This has for some time been the accepted route to becoming a healer however at this time of ascension many people in their own time and space are becoming aware of their healing ability and the healing energies their soul wishes them to bring through. It is akin to a remembrance dawning or an activation of your divine right. The vibration of the Earth and humanity is quickening significantly causing many to remember their truth; their natural healing skills and alignments. If your natural healing ability is activating you may be experiencing heat or a tingly sensation in your hands, feet and even in your chest, brow or crown. This may occur at certain times or even continuously throughout your day. Remember that every part of your body has the ability to express healing energy. You may feel energy flowing through your body like a current of electricity. Know that as your healing ability awakens so your entire being and physical body opens and expands. This may create a deep clearing on many levels, enhanced sensitivity and heightened intuitive senses. Your natural healing ability is not awakening from a past or simultaneous lifetime; it is awakening from your original energies, the truth and essence of your being; your soul, which is an expression of the Creator. Many people may remember the healing techniques they have used in other lifetimes and they may feel guided to share these gifts once more. However, it is the healing ability of your soul which is activating and awakening at this time of ascension. A healing ability aligned with the truth vibration of your soul. This may be a healing you have used in many lifetimes; it is the purest expression available to you through your soul. There may also be many healing vibrations which your soul channels through you, each will have a specific purpose and meaning to you while allowing you to serve others. Whether you already recognise yourself as a healer or not, take time to sit peacefully in meditation or surrounded by beautiful nature. Repeat, ‘I am a healer, I embody and express my soul’s healing abilities.’ Focus upon your soul star chakra above your head, breathing in and out of this area. Allow the energy of your soul and natural healing abilities of your soul to build as a source of light in this areas. Then place your focus within your earth star chakra below your feet, breathe into this area until you feel the energy of your soul build. Take the attention of your mind to your heart chakra or higher heart chakra recognising your soul’s energy. Radiate this energy in all directions allowing yourself to be divinely inspired by the guidance of your soul as to your healing ability. Your soul may instantly align you to the healing frequency it wishes you to express which may be an aspect of your soul or a frequency from the universe of the Creator. Your soul may share with you the way you can express the healing energy or may simply pour the energy through your being inviting you to observe. It is important to realise the more you practice this exercise, the greater your experience and understanding will become. You can then use the energy expression to support your own healing journey while accessing greater understanding of its influence upon your being. Thus taking responsibility for the energy you express. A belief will manifest that you have the ability to heal any situation in your reality with ease and perfection. Every person is a natural healer and heals in a perfect way aligned to the Creator. With your soul’s healing abilities awakening your soul will make you aware of certain energy frequencies it wishes you to express. This ties into an energetic shift which is occurring upon the Earth now. Throughout numerous civilisations and areas of the Earth, people have been practising and expression diverse healing techniques. The healing frequencies and information concerning the healing method still remain with the land where they were practised. Mother Earth is now sending her own healing energies across her body with the purpose of activating all appropriate healing frequencies and methods anchored into the land. Some of the healing frequencies may have been lost or long forgotten. There is now an opportunity for ancient and much needed healing frequencies and understandings to return to the conscious awareness of humanity. Thus, humanity’s knowledge of healing especially healing the physical body will progress and develop immensely. This could cause new understanding in regards to supporting the physical body in healing which would become mainstream and globally accepted. Mother Earth invites you to express the energy of your soul to surround the Earth, with the inrtention of activating appropriate healing frequencies and methods, which are required to be remembered and are an integral part of the ascension process of all. Energetically through meditation you may be drawn to a place upon the Earth to receive and accept the healing frequencies and methods which were once used there. You may even be inspired to physically visit certain areas of the Earth or discover you are becoming aware of a healing frequency in a place upon the Earth you had not expected. It is important to allow yourself to be open and receptive, knowing you cannot push or encourage the process to occur, it will manifest with divine timing and perfection. Simply call upon my energies, Archangel Raphael, to surround you. Whether visiting a place energetically or physically know my green light will support and guide you. 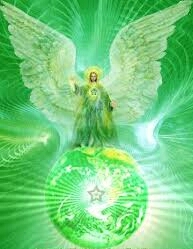 As you exist in my bubble of green light simply allow yourself to be guided by your intuition which will share all that is needed and required. The awakening of ancient healing frequencies and methods which have been safeguarded within Mother Earth coupled with your soul wishing to guide you in realising your natural abilities as a healer, signify a major shift in the consciousness of humanity. Collectively many are taking responsibility, remembering the truth, realising the delusional habits of humanity and wishing to return to a purer alignment with the truth of the Creator. If humanity realises they can receive healing and express healing from the universe of the Creator, this would instigate a very powerful shift in perceptive as many would no longer seek outside of themselves to restore physical, emotional and mental balance and health. This would change how the entire world experiences their day and life. Empowerment, freedom and choice would be the key experiences which would accelerate ascension tremendously. This will take time to manifest however it is a future humanity is moving towards. A step closer is taken for all when one person really allows themselves to tune into and believe in their own ability’s to receive and express healing. It is time to play your part in the development, believe and trust in the magic of energetic healing.